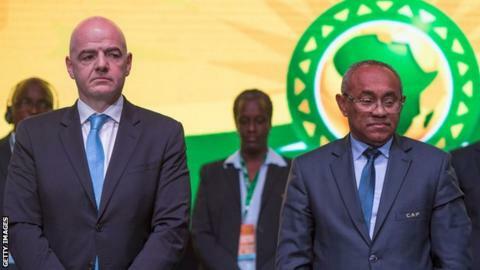 Fifa president Gianni Infantino with Caf president Ahmad at the African Football body's 40th General Assembly in Casablanca, Morocco. The Confederation of African Football (Caf) president, Ahmad, expressed his frustration that the African body is not able to publicly endorse Morocco's bid to host the 2026 World Cup. Speaking after Caf's 40th General Assembly in Casablanca on Friday, Ahmad was tight-lipped about Caf's stance on the bid, despite giving it his personal backing. Last week, Fifa issued a reminder about the "Rules of Conduct for the process to select the host(s) of the 2026 Fifa World Cup." With the Fifa president Gianni Infantino in attendance at the Caf assembly, Ahmad simply announced that Morocco has submitted a bid. "May the best bid win - Africa is the best," said Ahmad in reference to his backing for Morocco's bid against the joint one from USA, Mexico and Canada to host football's showpiece event. "I am for Morocco as you know as I have already said it," Ahmad later added. "I won't be neutral, I can tell you what I want - when others are asked I will let them reply as they wish. "I will act within the regulations and with the advice of my legal counsellor," Ahmad added. Morocco officially launched its campaign and logo last month, having failed in four previous World Cup bids - in 1994, 1998, 2006 and 2010. One of the points in Fifa's "Bid Rules of Conduct" reads: "All officials shall refrain from publicly making any written or oral statements of any kind, whether adverse or otherwise, about the bidders in relation to their bids." Ahmad chose his words carefully when pushed about how far Caf could go in showing support for Morocco's bid. "I can't tell you today how or when I will act, but the fact that I'm speaking openly about it is a backing, isn't it? "Nothing says I can't do it (back the bid). Mainly because I'm not a voter." The hosts of the 2026 World Cup will be chosen by a vote of all 211 member associations of Fifa on 13 June, the eve of the 2018 World Cup in Moscow.